Our home’s interior usually gets all the spring attention with cleaning closets, washing curtains and blinds and killing the dust bunnies under the beds. The list is practically endless. The garage, however, is that place we overlook and is most likely to be the catch-all for things that have no home. It becomes the ‘undecided graveyard’ of many things. Or the ‘I’ll find a place for this later’ location, not to mention the home for tools and other outdoor storage. It can easily feel overwhelming! Follow this plan to declutter and organize and apply a coating to your garage floor. Step one is to get the vehicles out and make some piles. Create a donate pile for all the things you have no room or use for anymore. Still can’t decide if you should give it away or throw it away? Let someone else help you. Often we are stifled by the decisions that organizing requires. Bring in someone from outside your home to help move the process along. Gather all items that are just strewn about i.e. sports equipment, yard tools, shoes, bags of salt or sand, etc. Designate areas for these items. 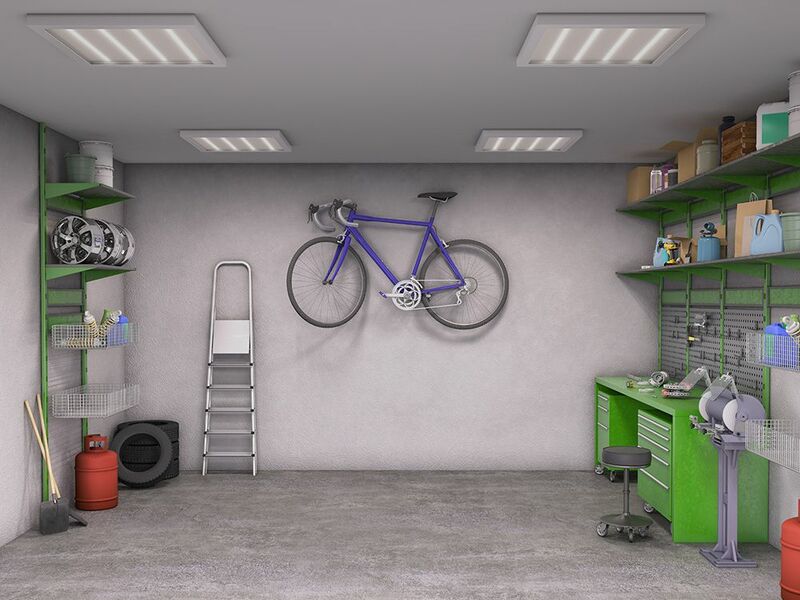 Regardless of how you use your garage space, it’s best to keep the floor open either for vehicles or setting up a work area for your Saturday DIYs. So, using the perimeter to stack storage bins or adding a shelving unit is best. If you do not have any storage cases and need some ideas, check these out , or make a list of the sizes of storage bins you will need. Lastly, sift through any paint cans or chemicals or other items that end up in the garage. Decide if it still usable, if not, set them aside for proper disposal/recycling. Not sure where to begin, click here to type in zip code and item that needs to be recycled. Garage floors take a beating. From the weather to the kids slapping hockey sticks to the car leaking oil, the garage floor takes some serious abuse. Concrete is durable but still requires maintenance, this concrete coating will do the job right. After you’ve removed and sorted all your piles, it’s time to sweep and hose off the floor. For concrete floors that have been painted before, you will want to use Anvil Concrete Cleaner & Etcher to degrease and clean OR try using a solution of ½ cup TSP (trisodium phosphate) per 1 gallon of clean hot water to prep the surface. Once your surface is properly prepared it’s time to apply a coating like Anvil’s Gator-Grip. This concrete coating will give your garage floor a safe, non skid, and textured finish. Just choose a color and go! One dedicated weekend to your garage can add the value to your home and peace of mind.